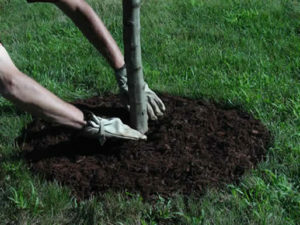 Mulch is a very important protective measure for shrub beds and around trees. In addition to being helpful in controlling weeds and maintaining a neat and tidy appearance, mulch helps to keep the soil at a more constant temperature. This protects the roots from freeze and thaw damage in winter, and prevents heaving. It also promotes root growth and keeps the roots moist during dry weather. Decomposing mulch helps to provide necessary nutrients to the plant material. Three inches of fluffy, uncompacted mulch is optimal. At Abbondanzo’s, we use a double shredded hammermill dark pine bark mulch. We have found this to decompose at a swift enough rate to assist in the growing process, unlike pine bark nuggets, and without going so fast as finer mulches do. This mulch has a terrific consistedncy for most landscape purposes. Generally, this mulch decomposes at a rate of about an inch per year. Therefore, since original mulching should be at least 3 inches, it is recommended that that beds be remulched with at least one inch annually. For cosmetic purposes, additional mulching may be desired. One cubic yard of mulch will approximately mulch just over 100 square feet or 325 feet of remulching.